More than 370 million years ago, trees, which are younger than sharks, were just starting to emerge on the planet’s surface. One would imagine that these early trees were quite primitive, but a new intriguing study found the contrary is true. After analyzing the fossil remains of an ancient tree found in north-west China, scientists were amazed by the intricate ‘pipework’ they encountered, telling of far more complex anatomy of that of modern trees. Scientists don’t know yet why primitive trees were far more complex than modern ones. Trees conduct water and precious dissolved minerals from the root to branches and leaves through a vascular tissue called xylem (from xylon, a Greek word for wood). Think of it as a pipeline from the roots to the leaves. 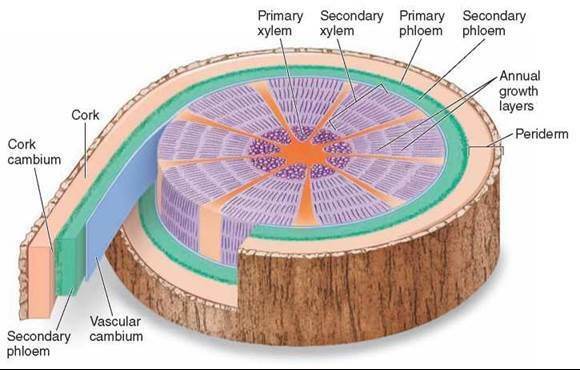 The vast majority of trees form a single cylinder out of xylem which grows in rings year by year just under the bark. In some other trees, such as palms, xylem forms in strands embedded in soft tissue throughout the trunk. Tree rings or xylem growth can be easily seen in conifers (e.g., pine, spruce) and hardwoods (e.g., oak, ash). During a tree’s rapid growth period, the xylem cells grow large with thin walls and the rings look light-colored. In summer, when growth slows, the walls of the xylem cells get thicker, reflected in the darker-colored part of a tree ring. Rings are the result of water carrying vessels called xylem being added each year. Credit: Quora. Generally, a tree’s vascular system is quite efficient. However, nothing prepared scientists for the surprising complexity ensued before their eyes after they analyzed a 374-million-year-old tree found in Xinjiang, north-west China. 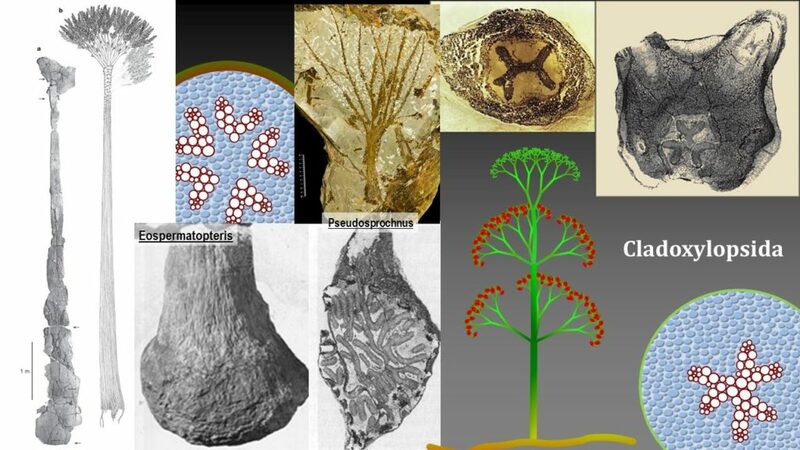 Fossils of early trees are not only rare but also damaged. Most such fossils are filled with sand which tells us very little about the inner workings of the ancient tree. On the other hand, the Xinjiang fossilized trunk belonging to a group of early trees called cladoxylopsids is “perfectly preserved in glassy silica as a result of volcanic sediments, allowing us to observe every single cell of the plant,” according to Dr Chris Berry, from Cardiff University’s School of Earth and Ocean Sciences. Berry, along with others colleagues at the Nanjing Institute of Geology and Palaeontology and State University of New York, were amazed by the rich dispersion of xylem they encountered. Unlike modern trees, the trunk was completely hollow with the xylem exclusively growing in strands in the outer 5 cm of the tree trunk. Like a network of water pipes, the narrow strands were interconnected to each other, allowing the cladoxylopsid to grow in an unconventional fashion. Rather than laying down one growth ring with every passing year, each of the ancient tree’s hundreds of individual xylem strands grew their own rings. On the inside, it looked a lot like a collection of mini trees, the researchers say. In time, the strands grew bigger, increasing the volume of soft tissue between the strands. Consequently, the trunk expanded as well. To accommodate the enlarged growth, the scientists found that the connections between each strand split apart then self-repaired. Intriguingly, the xylem grown at the bottom of the tree’s trunk rolled out from the side of the trunk. This mechanism led to the characteristic flat base and bulbous shape for which cladoxylopsids are famous. The Cladoxylopsids were a geologically short-lived, fern-like group of plants, which displayed complex morphological and anatomical patterns. Credit: Plant Evolution & Paleobotany. “There is no other tree that I know of in the history of Earth that has ever done anything as complicated as this. The tree simultaneously ripped its skeleton apart and collapsed under its own weight while staying alive and growing upwards and outwards to become the dominant plant of its day,” said Berry, who has been studying cladoxylopsids for nearly 30 years. We don’t know yet why but future work might shed more clues. Berry and colleagues are also interested to learn how much carbon these sort of trees were capable of sequestrating and how they affected the planet’s climate. Scientific reference: Hong-He Xu, Christopher M. Berry, William E. Stein, Yi Wang, Peng Tang, Qiang Fu. 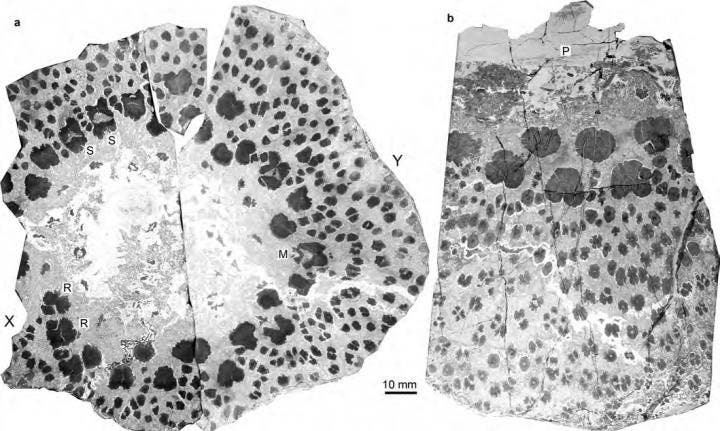 Unique growth strategy in the Earth’s first trees revealed in silicified fossil trunks from China. Proceedings of the National Academy of Sciences, 2017; 201708241 DOI: 10.1073/pnas.1708241114.